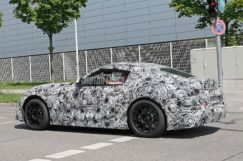 We’ve seen the Toyota Supra mules running around here and there for a while in heavy camouflaged wrapping. We’ve seen a spied photo pop out recently where it was seen on the streets of Tokyo and now it was spied being tested in Germany with the usual camoufloug. But the only difference this time its now having a very clear visible headlights which look fully LED as of todoay’s standards. This test mule we believe to be as close to the production model to be revealed soon at this year’s Tokyo Auto show 2017. 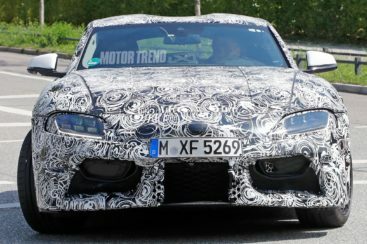 The supra’s headlights appear to have six individual LED projectors per housing, with two rows of three lenses in each. It looks very similar to today’s Lexus headlights. 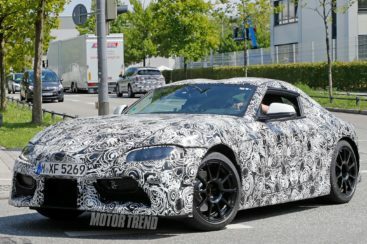 The new supra will share the platform with the BMW Z5 convertible because of the joint development deal signed between Toyota and BMW. The power house will be four and a six cylinder BMW’s turbo charged engines which we will find in their 3 Serieses. Disappointing? well we can’t argue until we see its other specs, especially its driving dynamics and handling suspension weight, transmission etc. There is also a rumor for it to have a twin turbo V6 of toyota. The new supra makes you feel like its just another mass produced affordable sports car placed one step higher than the on going GT86. Toyota is playing too safe in our opinion. We can’t say much unless we see the actual confirmed specs and how it would look but for now we have to anticipate the options and what it would turn out to be by looking at this camouflaged silhouette. The world now cannot wait for this to be revealed!